When I first heard Neapolitan Joe-Joe's were a thing, I thought maybe there were chocolate Joe-Joe's, vanilla Joe-Joe's, and strawberry Joe-Joe's all in one package, kinda like the ice cream. But when I realized all three flavors were present in each Joe-Joe, I was even more curious. Which flavor would dominate? Wouldn't all three flavors be at odds with one another, kicking, biting, and scratching their way to beat the other two to your taste buds like a cutthroat free-for-all of flavors? The short answer to that question is "no." They actually work together. But if you're wondering which flavor would have won that hypothetical miniature battle royale, I'll just go ahead and say in my humble opinion, strawberry would have. Strawberry creme. Heck yes. Sonia agrees. Chocolate comes in second in this equation. 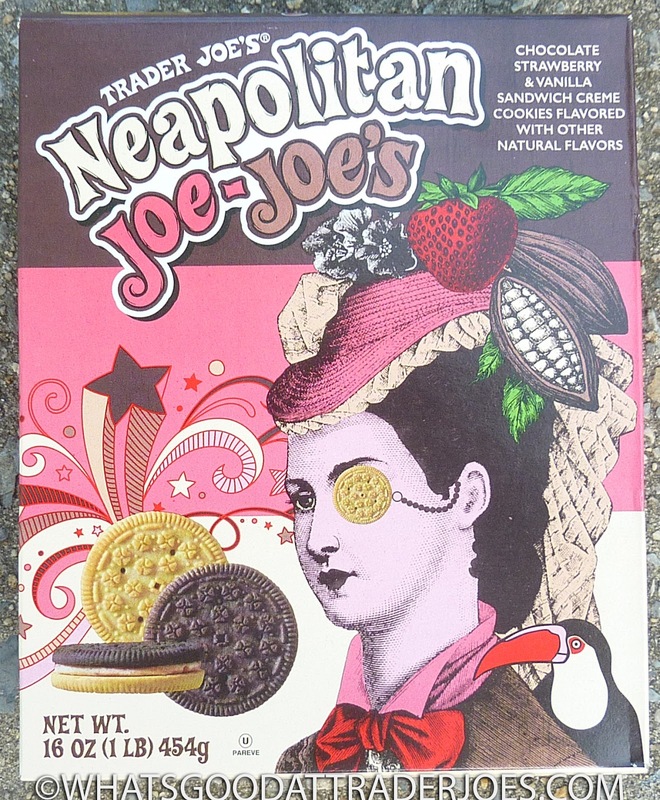 I think that I, personally, might have enjoyed these cookies slightly more if they had gone with two vanilla cookies on either side of the strawberry creme and simply called them Trader Joe's Strawberry Joe-Joe's. That would have allowed the sweet, delicious strawberry flavor to shine even more. The chocolate cookie part of a sandwich cookie is usually not bad, but it rarely impresses me either. 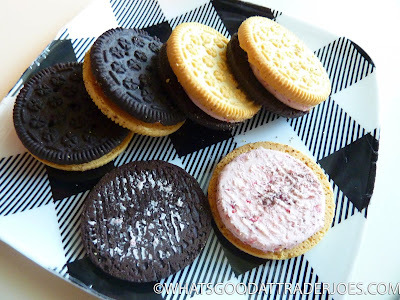 The chocolate cookies have a slightly more pungent taste than the vanilla cookies, but they blend well enough with the strawberry flavor that I didn't mind them much at all. After all, chocolate and strawberry is an excellent flavor combo. We've tried a lot of Joe-Joe's and Joe-Joe derivatives throughout the years, and these are among the best. $2.99 for a pound of cookies. 3 rows of 11, all wrapped together in plastic and cellophane. I suppose it would add some cost and a little extra packaging, but individually wrapping each row might help keep some of the cookies fresher longer in case you're not planning on eating 33 cookies in one sitting—but for the sake of being "green" I guess we can put the remainder in ziplock baggies that we already have around the house. I like the approach of using two different flavored wafers than just flavoring the creme by itself. Hope we see different unique flavors from TJ's. 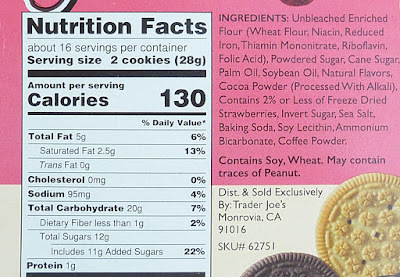 Why there haven't yet been a cookie butter joe joe's. 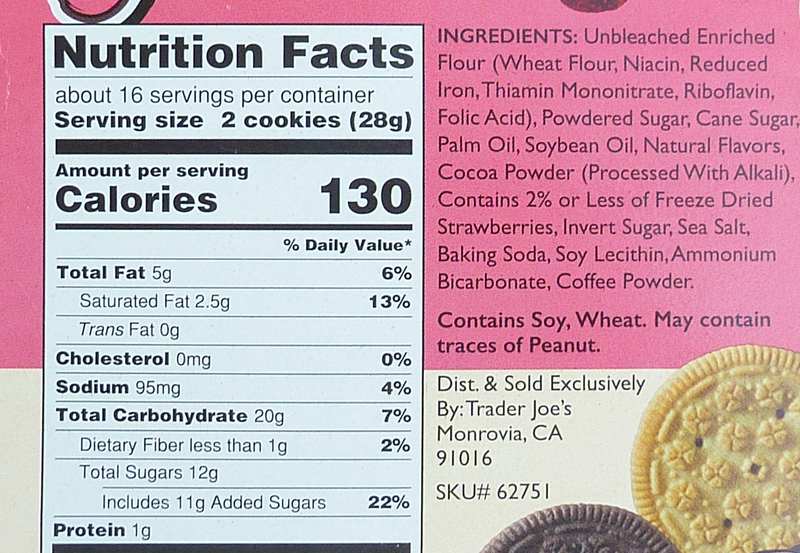 I know that there are sandwich cookies but in a joe joe form. These will only be available for a few more weeks, so snap em up now while you can!